The Mersey Gateway project will provide a new road link to relive pressure on the existing road bridge at Runcorn. It’s being constructed to the east of the existing bridge, and scheduled for completion in late 2017. Can you identify the four navigable waterways the route will cross – there’s a clue for one of them in the title of this post. 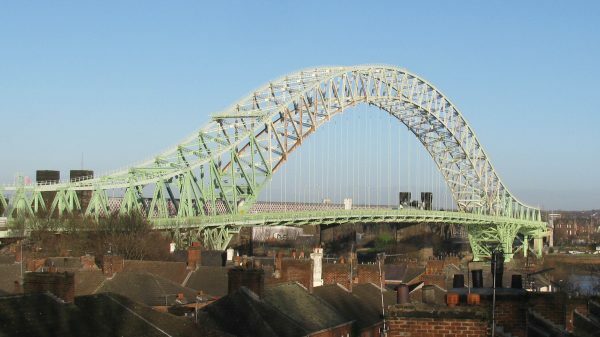 This is the iconic road bridge that carries all the road traffic across the River Mersey at Runcorn today but it’s very congested, especially around the rush hours. You can just see the parallel rail bridge behind. These bridges also cross the Manchester Ship Canal. It’s the approach roads to this road bridge that block the line of the Bridgewater Canal at Runcorn Locks. 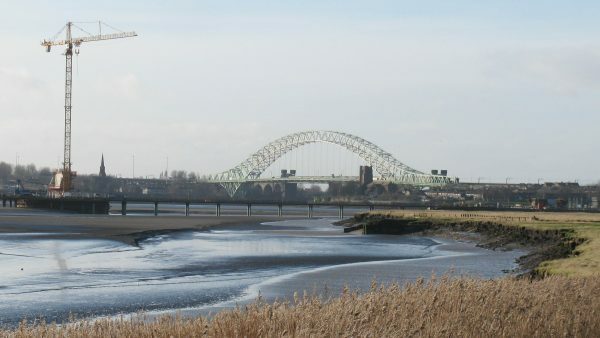 It’s hoped that, when the Mersey Gateway Bridge is opened, that realignment or modification of the existing approach roads will permit re-opening of those locks. Taken from the existing (old) road bridge this shows how wide the River Mersey (Waterway 1) is, and how little water it carries at low tide, with the many sandbanks that make navigation difficult. Across the centre of the photo is a temporary causeway linking the piers with tower cranes on them which are building the new Mersey Gateway Bridge. 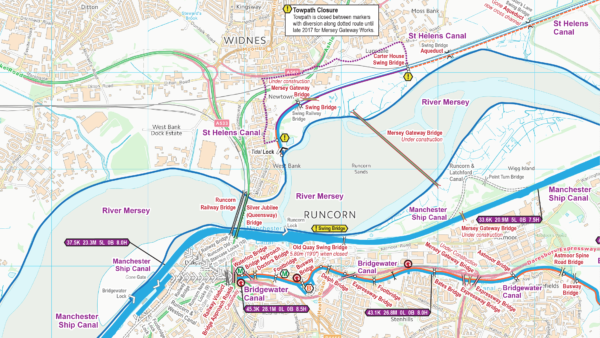 Running along the right hand edge of the river is the Manchester Ship Canal (Waterway 2). 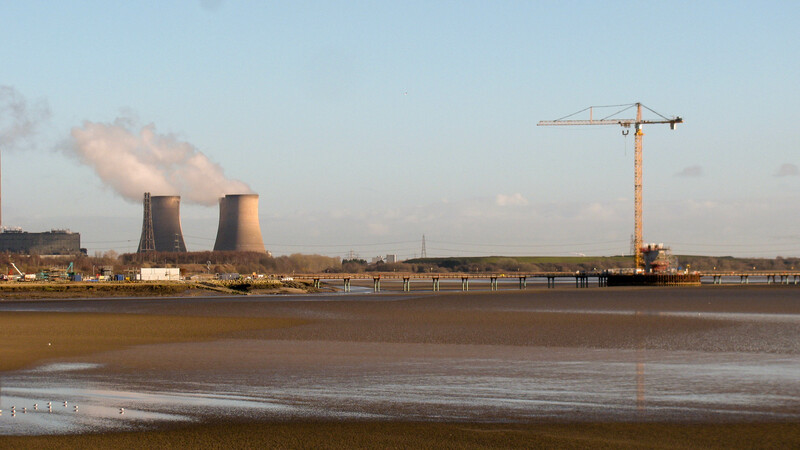 A closer view shows the northern pier and the tower crane starting it’s construction. The temporary causeway linking this to the north bank of the Mersey is visible too. In the background are the cooling towers of Fiddler’s Ferry Power Station. 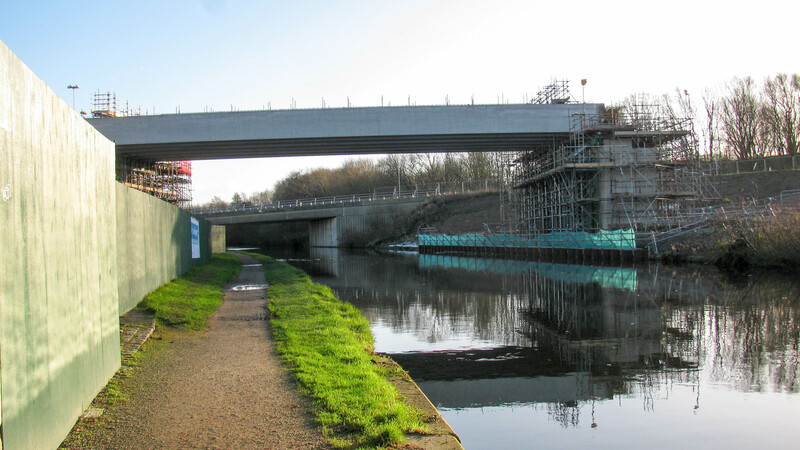 To the south of the River Mersey and the Manchester Ship Canal the Mersey Gateway route will cross the Bridgewater Canal (Waterway 3) and construction of this bridge is well in hand. It’s already shown on my maps and I wonder how long before others show this new bridge. 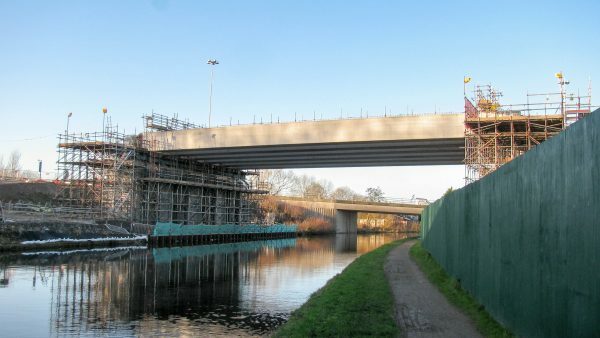 The towpath and navigation of the Bridgewater Canal remain open most of the time, with short temporary closures for critical phases of work on the bridge. That’s three waterways named. Have you identified the fourth? There’s no pictures of the bridge work over the fourth waterway yet – this is the nearest I can get to take a photo. 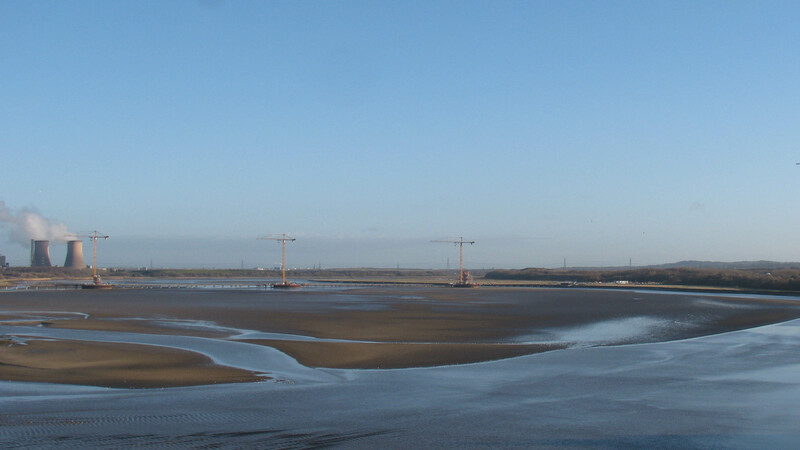 The Mersey Gateway will continue north (to the right in this photo) and cross the St Helens Canal (Waterway 4). 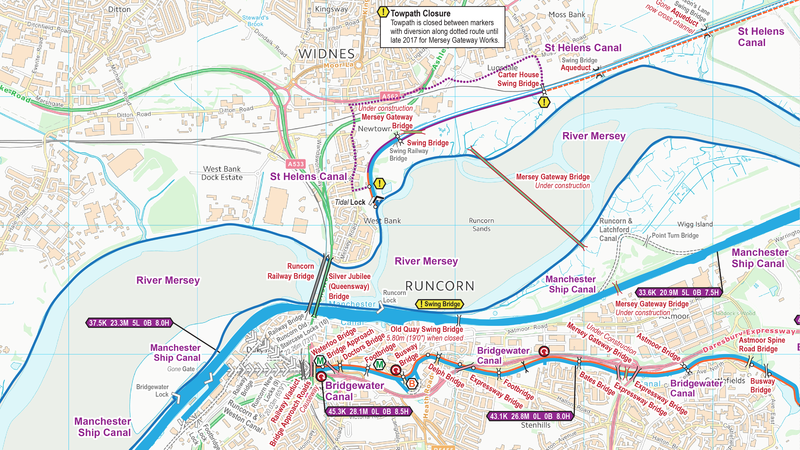 The Mersey Gateway is shown on my England & Wales waterway maps, and the individual maps for the Bridgewater Canal and the St Helens Canal. This entry was posted in Bridgewater Canal, Manchester Ship Canal, River Mersey, St Helens Canal by Paul. Bookmark the permalink. ← Previous Previous post: How Big Is Your Bridge?